Should you join over 10,000 businesses and start and grow your business in this up-and-coming Scottish city? 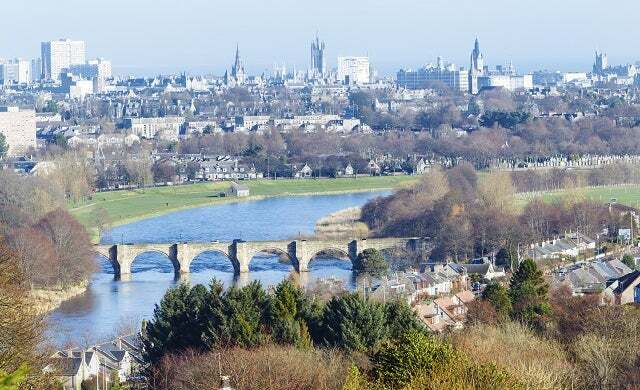 Why start a business in Aberdeen? Scotland’s third largest city, Aberdeen benefits from its location near the hugely lucrative North Sea oil and gas reserves, and as such is the hub of the UK’s crude oil and energy market. With granite quarries also close by, the city’s access to natural resources is almost unparalleled, and as such is a natural choice of location for a manufacturing, engineering or energy business. However, the city’s status as a centre of industry also means it is a very expensive place to set up shop – Aberdeen has one of the highest average office rents outside of London, with average salaries also extremely high (more on this below). You’ll need a significant reserve of working capital, so it’s not the best place for a bootstrapped start-up. Aberdeen has good international links, with Aberdeen International Airport just 15 minutes’ drive away from the city centre, from which you can fly to London Gatwick in just over an hour. But, if quick access to the UK capital is a priority then look elsewhere as the city is a long nine hours’ drive and seven hours’ train ride to London. It takes around three hours to drive to Edinburgh or Glasgow from the city. Aberdeen is a small city, but boasts two universities – the research-focused University of Aberdeen and the modern Robert Gordon University. Aberdeen is a top international university, consistently ranked in the top 150 of the global table, so should provide an excellent source of local talent. The university also provides various services to local business, including collaborative research, innovation assistance, training and recruitment and more. The lesser-known of the two, Robert Gordon University nevertheless boasts an impressive 97% employment rate for its graduates, and is consistently ranked among the UK’s top modern universities. A high number of the population, 73,800, boast NVQ Level 4 qualifications or above which makes Aberdeen one of the best-qualified cities in the UK. However, its educated workforce comes at a price – weekly salaries are at an average of £554.30, making it one of the most expensive cities to recruit outside of London, and only marginally lower than the Scottish capital Edinburgh (£559.70). For companies in the energy, tech and engineering sectors, Aberdeen offers a good range of top-class business support. While the city does not have Local Enterprise Partnership (LEP) status, the Business Gateway Aberdeen initiative fulfills a similar function – offering free advice, workshops and services for those in the area looking to start or grow a business. Start-ups and growing businesses can also benefit from the city’s accelerator programme hosted at Elevator’s Aberdeen Centre for Entrepreneurship. Ran by Enterprise North East Trust, the Centre is a £1m facility set in the heart of the city’s Energy Park, and aims to make the city into a global hub of entrepreneurship in the energy and technology sectors. Founders take part in a 20 week “intense experience” to become investment ready. Aberdeen also boasts The Data Lab; an innovation centre for start-ups and small businesses with a core mission to generate significant economic, social and scientific value from big data. Tech, scientific and energy businesses also have the option of locating in one of the two Aberdeen Energy and Innovation Parks, situated near the airport and around three miles outside the city centre. With tenants ranging from small start-ups to international organisations, land is available both for leasing and development. Energy businesses across the supply chain have found their home there, so it’s a particularly good option if you could benefit from excellent networking and knowledge transfer opportunities within that sector. Balmoral Business Park is another option, with a more general focus. Aberdeen is one of Scotland’s major office locations, due to the booming energy sector, and high-quality space is in high demand. This has led to extremely high headline office rents – at £31.50 per sq ft on average, the only place you will find more expensive space is in London and the South East. There are a variety of office space and co-work facilities available to business owners in the city too such as The Soap Factory, Instant Offices, Elevator’s co-working development in the city centre, and facilities via Regus. Entrepreneurs who decide to locate in Aberdeen can access a number of different grants and funding schemes. The Support for Aberdeenshire Business (SAB) scheme offers a mixture of grant and loan funding to businesses with projects set to bring “additional economic benefit” to the region. Grants are available up to a maximum of £15,000, or 50% of the cost of a project. SAB also offers smaller grants for job creation, sustainable business, and rural shops. Elsewhere, there is the Aberdeen City and Shire First Development Grant, which can provide start-ups with small loans of up to £1,000 to support them in taking on their first employee. As with many other cities across the UK, financial assistance of up to £3,000 is also available to enable businesses to set up high-speed internet through the council’s Connection Voucher scheme. If you are a social venture, various grants and funding schemes also exist, which you can browse via the Foundation Scotland website. The city is served by two angel networks, both of which have close ties to each other. Aurora Private Equity generally invests in the oil and gas, engineering, bioscience, and other related sectors, with its network typically backing businesses with amounts between £10,000 and £500,000. EquityWorks is also based in Aberdeen, and operates on an unusual model whereby the network only takes a minority stake in companies after it has successfully helped them raise outside funding. Despite the high salaries and cost of living generally in Aberdeen, house prices have declined somewhat over the last year from an average of £205,365 in 2015 to £171,955 – far lower than Edinburgh (£231,103). Despite its rather remote location (the nearest city is Dundee, some 70 miles south) and small size, Aberdeen punches above its weight in terms of the experience it offers visitors and residents. The city is characterised by imposing, ornate granite buildings and a large amount of parks and green space. It consistently ranks among the happiest places to live in Britain due in part to its access to the countryside, high standard of living, and community spirit. In terms of attractions, Aberdeen boasts an impressive array of diversions, including castles, whisky distilleries, and a stunning coastline with vast sandy beaches. Golfers should find the city particularly suited to them; the North East of Scotland has 70 golf courses, some 30 of which are just a 30 minute car ride from the city centre. A first-hand account from an early-stage start-up on what it’s like to start a business in Aberdeen and what the city has to offer new entrepreneurs. You can also gauge insider opinion on what more Aberdeen needs to do to accommodate start-ups. SBNN discusses how business-to-business start-ups can flourish in Aberdeen and why there’s a need for more angel investors.